If you were to visit your doctor today, that doctor might send you to a lab to get a blood test. Then you’d go for a follow up exam, but if that blood test raised other questions, you might have to go get another vial drawn from your arm. Finally you’d return for a third doctor’s visit. Three doctors visits and two trips to get blood drawn in a lab. That’s expensive and inefficient. 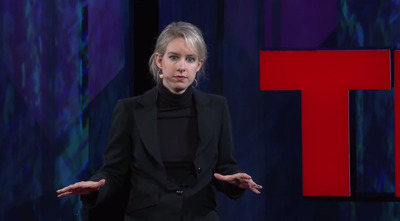 Between 40 and 60% of people don’t even end up getting the lab tests their doctors ask them to, due to the cost, time involved, and perhaps a fear of needles, according to Elizabeth Holmes, who spoke at TEDMED in Sept.
Holmes wants to change that. She is a Stanford dropout who founded a company called Theranos that’s trying to revolutionise the blood test. Instead of having to go to a lab to get blood drawn and then having the results interpreted by a doctor, Theranos has set up a system where people can walk into a Walgreens for an apparently painless fingerprick that draws a tiny drop of blood. Theranos’s system allows them to run dozens of tests on that single drop of blood, with results available within a few hours. They can run one test and then do follow-up tests from the same sample, all for 50-90% cheaper than Medicare reimbursement rates. Revolutionizing the blood test made Holmes a billionaire. But that golden idea should be good for lots of people, not just her wallet. Holmes says that the transformative thing here is providing people with information that they can use to change their lives and become healthier. Having a quick test done before a trip to the doctor could eliminate unnecessary lab visits, but Holmes envisions a world where anyone can get a test done and then use that information to try and improve their health. While there are limits on how much use an individual could get out of a blood test on their own, she does mention some that might be handy, including a blood-based pregnancy test or a test for a sexually transmitted infection. The idea that a pre-diabetic person could monitor their blood sugar in that way is potentially useful too, though these conditions would all require a consultation with a doctor as well. We still don’t know exactly how these blood tests work — that information has been kept a closely guarded secret, and so we can’t directly compare these tests to all traditional blood tests. Still, simply having more information more readily available to doctors without additional testing for a cheaper price seems like a big development. After all, Holmes explains that lab work drives up to 80% of clinical decisions, and anything that reduces costs associated with those decisions is a huge step.